As an appraiser, Leila Dunbar knows Yankees memorabilia is king, but as a sports fan who grew up outside of Boston, her heart remains with teams like the Red Sox, Celtics, and Bruins. In this interview, the former auctioneer for Sotheby’s discusses some of her favorite sports items, from the bat Babe Ruth used to hit his first homer in Yankee Stadium to the Boston Garden’s famous parquet floor. She also explains the methodology she uses to appraise items, including one-of-a-kinds. Dunbar, who has her own company but remains a consultant for Sotheby’s, can be reached via her Antiques Roadshow page. 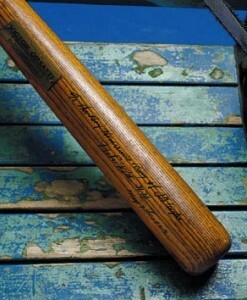 Babe Ruth used this bat to hit his first home run at Yankee Stadium. Sotheby’s sold it for $1.25 million. When I was about 10 years old, my dad started collecting antique toys, advertising posters, signs, folk art, and pottery. Soon after, we did Brimfield together, this huge outdoor antique show in Massachusetts that today covers 18 fields and runs for 10 days. Back then it was held on one field over two days. Before the sun came up, we would drive our van out to Route 20 and just park on the side of the road. While my dad would be running around buying stuff to sell, I’d set up. Sometimes he’d let me do a little shopping, too. My first big purchase for him was a group of antique automotive and soda signs, which I bought for 50 cents each. He was able to sell them for $5 to $10 apiece, which was a big profit then. I think I got a hot fudge sundae out of it, which started my lifelong love affair with chocolate! I was also a big sports fan. Our town, Milford (where Howie Long played high school football before heading to Villanova and the Oakland Raiders) was very pro-girls sports. I played softball and volleyball. Today I mostly golf with my boyfriend. I find that after years of injuring myself, the worst thing that can get hurt on the golf course is my feelings. Being brought up in Boston, I followed the Red Sox, Bruins, Celtics, and Patriots. My mom was a tennis player and my dad was a part-time demo-derby and stock car driver. My grandfather played football at Yale until he broke his legs and went to divinity school. He ended up being a minister in New York, where he was a devout Yankees fan. He had passes to Ebbets Field, the Polo Grounds, and Yankee Stadium. As a result, I spent a good chunk of my youth on Cape Cod, where my grandparents retired, arguing the merits of Thurman Munson versus Carlton Fisk, which is a pretty good way to spend your childhood, even though I always lost. Collectors Weekly: Was it difficult growing up with the Yankees-Red Sox clash in the family? Dunbar: Not really because it was just my grandfather. My father could’ve cared less. If there wasn’t a motor involved, it wasn’t a sport to him. My mom was a diehard Boston fan, too, because she’d been brought up in Newton, Massachusetts. I’ve lived in New York now for 11 years, and I still love the Red Sox. But I don’t hate the Yankees. I enjoy watching them when I’m in New York, except when they’re playing the Red Sox, and then I’m always going to root for Boston. There’s no way around it. Collectors Weekly: What are some of the best pieces sold during your time at Sotheby’s? 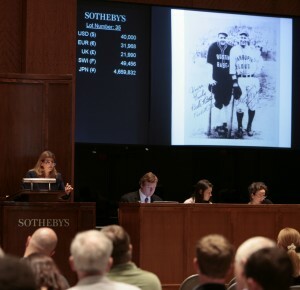 Dunbar (left) in action at Sotheby’s, auctioning a photo signed by Babe Ruth and Lou Gehrig. Dunbar: In 2004, Sotheby’s and SCP Auctions offered the bat that Babe Ruth used to hit the first homerun at Yankee Stadium in 1923. It was tough for me, though, because who did he hit the first homerun against? The Red Sox, of course. But when you sell something for $1.25 million, it does make you feel a bit better as it set a record for a bat. Six months later, Sotheby’s/SCP sold the 1919 contract that sold Babe Ruth from the Red Sox to the Yankees. Again, slightly painful, but it brought $996,000, a record for a contract. Babe Ruth’s slugging and personality literally pulled baseball out of the mud that it created for itself with the Black Sox scandal. Thanks to Ruth, baseball reinvented itself as the national pastime in the ’20s. If Ruth had not gone to New York, I don’t think his impact would’ve been nearly as great because New York was a much larger media base than Boston, a town made for Ruth’s Roaring ’20s personality. The Babe and New York were a match made in heaven. Probably my favorite Boston piece that Sotheby’s/SCP sold was the first ball thrown out at Fenway Park in 1912. That came originally from an American League umpire named Tommy Connolly, who was English but immigrated to the States, settling in Natick, Massachusetts. He umpired from 1901, I believe, right through the ’30s, and then he retired and became an official in the league. He was later elected as one of the first umpires in the Hall of Fame. According to the consignor, as well as another one, Connolly had two daughters who gave memorabilia to local folks who helped them with various chores. One of those people consigned a group of baseballs, including the Fenway Park ball, another one thrown out by Woodrow Wilson, a ball signed by General Black Jack Pershing, and a Ruth-Gehrig signed ball. Another consigned a group of American League season passes. Connolly, I believe, was also the umpire who worked at the openings of Shibe Park and Yankee Stadium. So I have a feeling that in Natick, there may be some other baseballs in peoples’ cellars or attics that they don’t even know they have. Collectors Weekly: Is Boston memorabilia as collectible as New York memorabilia? Dunbar went after the parquet floor from the Boston Garden because of her childhood as a Celtics fan. Dunbar: The fact is that the lion’s share of the greatest baseball players and greatest teams played in New York. It’s 27 championships versus seven, 44 Hall of Famers versus 12. So, naturally, today, Yankee related memorabilia is generally more collectible than Red Sox memorabilia. At the top of the heap, of course, is Ruth. Even though he’s been dead for 62 years, he’s still the most collected athlete. Ruth straddles both teams; you can consider him Boston or New York, but there’s far more memorabilia available from his years with the Yankees than the Red Sox. There’s only one known bat that I’m aware of from Ruth’s time with Red Sox. I think Heritage Auctions sold it a year ago for over a half million dollars. As far as I know, all the other bats that have sold for anywhere between, say, $150,000 and over a million dollars are from his time in New York. Collectors Weekly: Other than the Yankees and Red Sox, who are the most collectible teams? Dunbar: When I look at collectability and value, it’s all about winners, championship teams with compelling stories. So the next team I think of are the 1955 Brooklyn Dodgers. There is so much drama and sentiment that surrounded that team. They were a neighborhood team, loaded with great players such as Pee Wee Reese, Duke Snider, Carl Erskine, Carl Furillo, and local boy Gil Hodges. They integrated baseball with the first generation of great black ballplayers with Jackie Robinson, Roy Campanella, and Don Newcombe. I spent a good chunk of my childhood arguing the merits of Thurman Munson versus Carlton Fisk. From 1947-57, New York was the epicenter of baseball—a New York team played in every World Series during those years. From 1941-1956, the Dodgers played the Yankees seven times in the World Series and lost six of them, many in seven games. They were the underdogs so you had to root for them to win. Wait ‘til next year! Da Bums! They finally did it in 1955, just once, and then, of course, they moved to Los Angeles and continued to win World Championships and bring excitement to the West Coast in the 1960s, thanks largely to Sandy Koufax and Don Drysdale and Maury Wills. But they were never forgotten in Flatbush. Collectors Weekly: When you’re appraising an item, what factors do you take into account? Dunbar: First I look at what the historical narrative is, the historical context. Who is the player, what is the item, what was its relationship to the player, what team was involved? It’s about winners and losers and great moments in sports history. 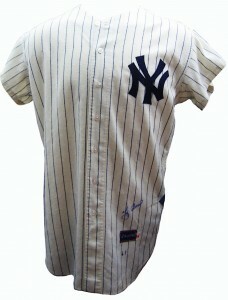 This is a 1961 Yankees uniform signed by catcher Yogi Berra. I always go by good, better, best. If you’ve got a new, signed jersey by Yogi Berra, then that would probably go for $300 to $500 because there’s an infinite supply. If you have a Yogi Berra game-used jersey, depending on when in his career he wore it—a regular season or World Series game, was he a fulltime or part-time player, was it an MVP season—it could bring anywhere from maybe $10,000 to $50,000. But the uniform that Yogi Berra wore during Don Larsen’s perfect game in the 1956 World Series, the only perfect game in World Series history? That sold for $560,000 because of its unique place in history. So you have to look at that historical context first. Then, you review potential comparables. For most pieces of memorabilia that’s fairly straightforward because there are so many auction houses out there now that have great databases that you can go into—Heritage Auctions, Legendary, Leland’s, Sotheby’s, Robert Edward, Hunt, EAC, SCP—and review past auction prices, augmented by your own experience. You have to consider condition, rarity, provenance, desirability, the story, the player, the moment, and how the item compares to others like it. If I think there is a potential issue with authenticity, if I’m not convinced it’s been proven authentic, I’m not going to appraise it. That said, I am not an authenticator, and I don’t pretend to be one. I will leave that to JSA, PSA/DNA, MEARS, and John Taube. So I’m very particular about the collections and archives that I’ll appraise. Collector’s Weekly: What are you working on now? Dunbar: I just finished working with the Yankees to prepare an insurance appraisal for several million dollars’ worth of memorabilia on loan to their museum at the new Yankee Stadium, everything from game-used bats and uniforms to championship rings and trophies. Virtually all the Yankee greats are represented, including Ruth, Gehrig, DiMaggio, Rizzuto, Ford, Mantle, Berra, Munson, and more. 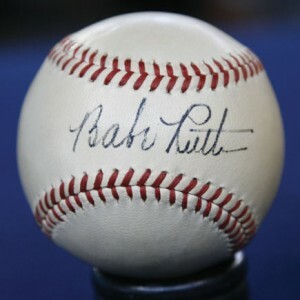 On a recent episode of “Antiques Roadshow,” Dunbar appraised this baseball signed by Babe Ruth for $30,000 to $40,000. There is also currently a special exhibition called the “Subway Series” paying tribute to the great New York rivalries. Pre-1958 New York Giants and Brooklyn Dodgers memorabilia is on display, plus some Mets pieces, including Mays, Robinson, Snider, Hodges, and Piazza. The museum has proven to be a huge hit. Brian Richards, the curator, has estimated that most nights the museum has 4,000-6,000 visitors, with 12,000 at one game during a rain delay. It’s fantastic to go there and be able to enjoy the present-day Yankees in the game, as well as memories of past players at the museum. Also, I recently appraised the collection of undefeated boxer Floyd Mayweather’s championship boxing belts and fight-worn robes and trunks for insurance. I also appraised the collection of movie posters, props, animation art, and comic art of an Oscar winner. My biggest project right now is updating the insurance appraisal for the United States Golf Association Museum in Far Hills, New Jersey, which includes the estates of Bobby Jones and Ben Hogan, as well as memorabilia from the roots of American golf. This has been an absolute thrill because I’ve really become a golf junkie over the last four years. It’s a privilege to be able to look at Bobby Jones’s Calamity Jane II putter that he used to win 10 out of his 13 major championships, or Ben Hogan’s one-iron that he hit one of the most famous shots ever in golf, at the 17th tee at Merion in 1950, which was the culmination of his comeback after almost dying in a car accident the year before. These are pieces that excite you because they make sports and the athletes come alive. Collectors Weekly: What are the most difficult items to authenticate? 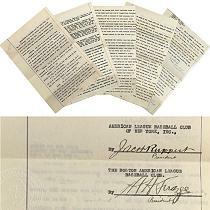 The contract that sold Babe Ruth from the Red Sox to the Yankees sold for $996,000 in 2005. Dunbar: Autographs are always going to be tricky if they don’t have a provenance. When I was at Sotheby’s, we had two approaches. One, we tried as much as possible to take things in on consignment from estates or directly from celebrities—be it Casey Stengel, Lefty Grove, Ernie Lombardi, Wilt Chamberlain, Katharine Hepburn, Johnny Cash, or Cher—because the chain of ownership was easier to verify. The other approach was to vet memorabilia through an independent third party, whether it was PSA/DNA or JSA. We would actually have both of them come in, and go through every piece before it went up for auction. There’s a book about the FBI’s Operation Bullpen, which, in 1999-2000, broke up a ring of forgers across the United States. They estimate that $100 million worth of fake autographs got into the market, and were distributed by all the big sellers. Forged signatures included Ruth, Gehrig, Cobb, DiMaggio, and Mantle. I give kudos to PSA and JSA for the challenges they face. Collectors Weekly: Is baseball the most collected type of sports memorabilia? Dunbar: To paraphrase Walt Whitman, baseball is America’s game. It’s been here for 150, 160, 170, 180 years, depending on who you talk to or what you read. People have been excited by baseball and collecting it for a long, long time. Therefore it has the widest collecting base, whether it’s kids collecting baseball cards and signed baseballs or those kids getting “older” and buying signed game-used jerseys, bats, and caps. Baseball has been a great sport since the era of Babe Ruth, when you could catch a ball, have a player sign it, and go home happy. Football, basketball, and hockey have all made great strides over the last 10 years to catch up in value, but to date none of those sports has the same legacy in the United States that baseball has. Because of baseball’s deeper roots and wider collecting base, it’s largely stayed ahead of the rest of the sports in collectability and value. Who knows if that will change in the future? Collectors Weekly: What trends have you seen recently in collecting? Dunbar: In collectibles, it’s just like the art world—quality sells. People still have money and they will spend it for the best quality. That’s why for the first time ever, you’ve seen three iconic comic books in fantastic condition sell for more than a million dollars this past year when the prior record had been $300,000. The steroids issue has created an enormous gray area. Where is Bonds or Rodriguez memorabilia going to be in five or 10 years? That’s also why you see great movie posters from the ’20s and ’30s from the Universal horror years sell for $200,000-$300,000. That’s why you continue to see great baseball memorabilia sell for hundreds of thousands of dollars. There’s a demand for the best of the best out there. Mediocre pieces, though, are easy to find, so the market for them has shrunk significantly. The economy is very volatile, and I think the haves and have-nots have been separated more than ever. The have-nots are having a hard time now. They may be going out and buying a gift for someone’s birthday or a present, but they don’t have as much disposable income as they once did. And those who do have disposable income are being incredibly selective at this point. I have found that the majority of great pieces tend to come up for sale at auction. There are still some very significant dealers who buy and sell privately, but I think the great estates such as Mantle, DiMaggio, and Stengel will continue to come out at auction. I think people realize that by putting a piece up for auction, the greater the piece is, because of competition, the better the chance is for achieving the highest price for the best objects. Collectors Weekly: What are some of the most interesting items, sports or not, you’ve sold or appraised over the years? Dunbar: One of my favorites was Mike Myers’ Shag Mobile from “Austin Powers” because it was the first big piece we were able to get during my first month at Sotheby’s. That car helped us launch the Sotheby’s/Amazon auction website. It sold for $55,000. 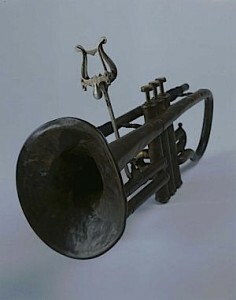 Dunbar has handled non-sports items, too, such as Louis Armstrong’s cornet from 1912, which is now at the Smithsonian. On another non-sports note, I’m a big jazz fan—I was a jazz DJ for 10 years in Massachusetts. At Sotheby’s we sold Louis Armstrong’s cornet that he first learned play on at the New Orleans Colored Waif’s Home in 1912. It sold for $108,000. It’s now at the Smithsonian. At Sotheby’s we also sold the lyrics to “Lady Sings the Blues” by Billie Holiday to a private client. Those are two of my favorite jazz pieces. 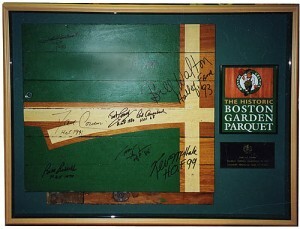 Another unique item was the Boston Garden parquet floor center court with the leprechaun logo, which had been played on by every Hall of Famer up to its dismantling in 1999. A lot of people thought Sotheby’s was crazy to offer it, but it sold for $335,000, an online record at the time. Being from Boston, I was thrilled. The sneakers Wilt Chamberlain wore when he set the NBA single-game scoring record are also among my favorite items, which sold for $52,000. Today I think they would sell for significantly more. In 2007, Sotheby’s/SCP offered a rare collection of 1934 Tour of Japan signed snapshots and baseballs from the family of a gentleman who was a rabid baseball fan and took photos during the tour, following the teams across the country. He had them developed and then had the players sign them. There were numerous Jimmie Foxx, Babe Ruth and Lou Gehrig signed photos. They were just amazing. I love that collection because of the history and the story it told—it was Babe Ruth’s last great hurrah. The collection sold for more than $500,000. Collectors Weekly: It sounds like your job requires you to become an instant expert. Dunbar: My degree is in journalism, which is about research and resourcefulness. Over the years, I’ve been able to learn about a fair number of pop-culture categories. I’ve been able to acquire a certain amount of knowledge and experience, and if I don’t have the knowledge, I know where to find it. The great joy is that it is a constant learning experience. Anyone in the antiques, art, and collectibles business, whether you’re a dealer, auctioneer, or appraiser, is constantly learning. The thrill is being able to handle a piece, to learn about it, and be able to tell the story. That’s one of the reasons I love the appraisal business so much. As a dealer or auctioneer, you’re only as good as your last or your next sale. As an appraiser, you walk in, you do your research, you prepare the report, and you get paid to have the experience. To me, that’s as good as it gets. Collectors Weekly: Are there other women who do what you do? Dunbar: There are many women appraisers who work in the art and antiques fields and a much smaller group who work in the pop culture field. I hope that the group will be able to grow in the next few years. The problem with pop culture is that there is no school that you can go to. As the daughter of a collector, I was exposed at a young age and I have been dealing, auctioneering and appraising for 23 years. You can only learn by handling the objects and that takes time. Collectors Weekly: How collectible are the stars of today compared to stars like Mantle and Ruth? Dunbar: It’s hard to comment on today’s players because you have to wait and see what their final legacy is going to be. The steroids issue has created an enormous gray area. How will collectors view Barry Bonds or Alex Rodriguez memorabilia in five or 10 years? Will Bonds, Clemens, Palmeiro, Sosa, or McGwire get into the Hall of Fame? There are a lot of questions that need to be answered. As for the “clean” players such as Jeter, Pujols, Griffey, Jr., and others, their game-used memorabilia is in demand. 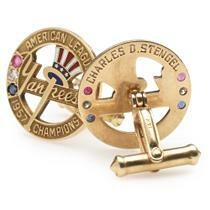 This pair of Casey Stengel cufflinks from the 1957 World Series sold for $72,000. I think the question marks associated with steroid use of some of the best modern players has actually created an even greater appreciation for those players like Henry Aaron, Willie Mays, Frank Robinson, Harmon Killebrew and Sandy Koufax who were the best of their era and continue to be the greatest of all time. Overall, A-Rod memorabilia has taken a lot less of a hit than Bonds did. In 2005 or ’06, Sotheby’s/SCP sold Bonds’ 700th homerun ball for only $100,000. Now, when you consider that there are only three players who ever hit 700 homeruns, that ball should’ve gone for a lot more. Of course, his 756th homerun sold for $750,000, but that’s the one with the asterisk on it in the Hall of Fame. In the collecting world, it’s all about supply and demand. For instance, at one point the first issue of “Sports Illustrated” magazine from 1954 was selling for $1,000 to $1,500. Then there was a giant warehouse find and now you can barely get $100 for a copy. The magazine is still getting older, but that boost in the supply has not been assimilated yet. When a player like Ted Williams, Mickey Mantle, or Joe DiMaggio passes away, all of their signed baseballs immediately go up in value, from anywhere between 50 and 200 percent, because they went from an infinite supply to a finite supply. So you see that sort of bump, but I don’t think age automatically makes something appreciate. It’s really about supply, demand, and how important the item is. Some things can become more important over time, some things can become less so. Collectors Weekly: Are non-sports-related items owned by sports stars valuable? Dunbar: In short, yes, even every day mundane items. For instance, our driver’s licenses are worth maybe $5-$10. A celebrity’s driver’s license can be worth anywhere from $200 to $10,000, depending on who it belongs to. Or, take passports. June Carter Cash’s passport could sell for $500. Johnny Cash’s could sell for $2,000, Frank Sinatra’s for $5,000. Joe DiMaggio’s can sell for $15,000, and Marilyn Monroe’s sold for $115,000. That’s the power and hierarchy of celebrity. When you’re looking at celebrity memorabilia, you always go back to the item’s importance to the person’s career, private life, and the achievements of the star himself. Awards, instruments, scripts, costumes, props, jewelry, and written material are just some of the major categories of celebrity collecting. At the top are Elvis, Marilyn Monroe, James Dean, the Beatles, Frank Sinatra, and Katharine Hepburn. When Sotheby’s offered the Hepburn estate in 2004, there were 100 of Hepburn’s own paintings, including the first two that she painted on Howard Hughes’ yacht in 1938, which was moored in the Bahamas. We estimated these paintings in the $500 to $2,000 range, depending on the image. Some were still-lifes, some were from her travels in Australia and England, some were from Connecticut, some were self-portraits. They sold from $8,000 to $78,000. Hepburn had also sculpted a bronze bust of Spencer Tracy, the size of a tennis ball. You can see it on his desk in the movie “Guess Who’s Coming To Dinner.” He died two weeks later and Hepburn kept it the next 35 years. It traveled with her and she called it her most prized possession. I estimated it at $3,000 to $5,000. 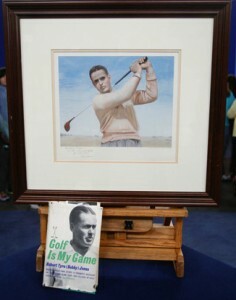 It sold for $316,000. The sale was estimated at $600,000 to $800,000. It brought $6 million. That’s when I learned that you cannot quantify emotion or passion on a given day. Collectors Weekly: How important is condition? Lefty Grove’s World Series ring is so worn down, you can barely make out the elephant, which was the mascot of the Philadelphia Athletics. I take that back. I remember one piece, Lefty Grove’s 1930 World Series ring. It was so worn down because he wore it his entire life, I didn’t even recognize it as his World Series ring—the Philadelphia Athletics elephant mascot had been worn down. Even the baseball had worn down. For that particular ring, it probably made a difference because if the elephant and baseball were crisp and clear, it would be recognizable. On the other hand he wore it every day, which some people appreciate because it is obvious that the ring meant a lot to him. When you’re looking at something that’s been autographed, generally condition is paramount. The best examples are Ruth baseballs. You can have a Ruth baseball in terrible shape, and it might sell for $2,000. You can have one in spectacular shape that can sell for $75,000. That’s a pretty wide range, so condition, particularly for items that are not one-of-a-kind, is critical. However if it’s an incredibly rare signature, rarity outweighs condition. Collectors Weekly: How do you appraise a one-of-a-kind item? Dunbar: For me, game-used memorabilia is not that difficult because there’s always some sort of comparable that you can use. If you have a game-used bat, you look at other game-used bats; a game-used uniform, you look at other game-used uniforms; signed baseballs, you look at others. Even a one-of-a-kind can generally be compared to other one-of-a-kinds that have sold. 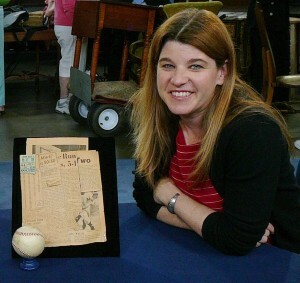 Dunbar on the set of “Antiques Roadshow” with a ball signed by Babe Ruth, Mickey Mantle, and Roger Maris. Take the Yogi Berra uniform worn during the Don Larsen perfect game. I can say that uniform was used in that one game. It’s a one-of-a-kind. Therefore, if I’m looking at this uniform that this person wore in this game and it’s a one-of-a-kind for this reason, then I can make some sort of correlation to other uniforms worn in World Series, All-Star, or record-setting games, adjusting, of course, for who the player is, what the game was, and what the moment was. Here’s another example: I had a wood-carved statue of a great sports figure, one that we all know, a Hall of Famer. It was being donated to a museum. These pieces generally don’t come up for auction. It’s a one-of-a-kind carving by the preeminent wood carver in the United States who’s known for his sports carvings. So how do I value that? Well, I had to go back and value it on two fronts. First, I had to find out what the artist’s commission structure was over a period of 20 years, and I had to have that corroborated independently. Second, I looked at bronze statues that had been created, even though they can be cast in a mold and the piece I was appraising was a one-of-a-kind. I interviewed 12 different sculptors who create bronze sports sculptures across the country, just to get a sense of the price range. So, after researching the price range for the bronzes and the commission structure for the wood sculptor, I was able to arrive at a value. You have to be flexible and reasonable. One approach does not necessarily fit all, and when you’re dealing with a one-of-a-kind item, you have to really think about your methodology and be able to back it up. Collectors Weekly: What about college sports memorabilia? Dunbar: College memorabilia is absolutely collectible, but for whatever reason it doesn’t sell for quite as much as the pro memorabilia. Take signed college championship footballs; you would think that a signed Texas Tech, Minnesota, or Notre Dame football from the ’20s, ’30s, ’40s, or ’50s would bring thousands of dollars, but they don’t. They tend to bring hundreds of dollars. I think if you brought them out to the alumni at that particular college and put it on their radar, they would sell for a lot more. In general, though, they sell for a lot less than you’d expect. It’s a great area for someone who wants to build a collection and doesn’t have a huge amount of money to spend. The big sellers in collegiate memorabilia tend to be for the big names. If you have a Michael Jordan game-used jersey from North Carolina, particularly from his freshman season, that is going to have high desirability. But in general, college just seems to lag behind the pros. That may change in a few years, but right now I think it presents a great opportunity. I have a one of a kind Ben Hogan photo that he posed for in 1953. My Aunt’s husband was friends with Hogan and this is truly a one of a kind pic. I can send a pic if interested or if you could give me some sort of appraisal. Just wondering what a signed letter in orignal envelope which also has Babe’s signature would appraise for? I have a 6ft long wood bench with back and arms that we believe was once in an Ebbitts Field office of the Brooklyn Dodgers. It was given to us 30 yrs ago by a family friend who was a sports writer for the Staten Island Advance in the 40s & 50s. Is there any way to verify this? Thankyou! Don’y know if you remember us my wife and I sold Antique advertising signs , tins, and various kinds of display cabinets in Brimfield for years. Eventually we got to do Indianapolis Advertising Show which we did for almost 20 years. We still enjoy vintage advertising signs etc. Last year we purchased a unbelieveable ribbon cabinet about 4 1/2 Ft tall with lots of drawers to literally display 100s of ribbons. It still has the makers tag on it from 1890’s. We’re retired now living near Myrtle Beach, South Carolina. I remember as a kid I was a huge Brooklyn Dodger fan I would trade a Yogi Berra card for a obscure Brooklyn player like Rube Walker. I’d give 5 Mickey Mantle cards for one of the Duke. I remember going to Ebbets field and seeing a double header. The Dodgers won the first game and that clinched the pennant. In the second game the brooks were down 3-2 late in the game. Rube Walker hit a single went to second on another single and than third on another. Next batter flied out he tagged up and got thrown out at the plate. I was about 10 at the time. Those Brooklyn fans were nuts rather than celebrate the fact they won the pennant by winning the first game they were all griping about Walker being thrown out in game 2 which meant nothing. “ ” Like the fabled sirens, it was the mermaids that really drew people to Spring Lake.